Take a day trip from Milan to discover the beautiful town of Verona, the famous setting of Shakespeare’s ‘Romeo and Juliet’ and the unmissable Sirmione, a stunning lakeside town on Lake Garda where ancient roman ruins meet the crystal blue shores. 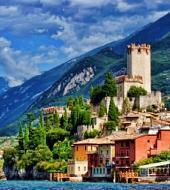 Verona is a beautiful and romantic city, a prosperous medieval town in its own and also a popular tourist destination. Step back into Shakespearean times and call for your Romeo from Juliet’s balcony or visit the exceptionally preserved ancient Roman Arena where during the summer concerts and operas are still performed. You will also have free time to explore the narrow medieval streets and the renaissance palace that make up Verona’s historic centre. The stunning lakeside towns around Lake Garda have fascinated visitors for centuries. The first people to fall in love with the area were the Romans, who made it a luxurious summer destination; and in Sirmione you can visit ruins and mosaics that mark their presence. Sirmione, which lies between the blue waters of Lake Garda and green olive trees, is undoubtedly one of the most romantic places on earth and its beauty has been praised by Roman poet Catullus since the early days. Visit the narrow medieval streets that burst with colour, the moated castle, Rocca Scaligera or take a wander through the towns most striking attraction, the grand Roman villa. Here you can admire the ruined walls and archaeological delights, including a charming carving of rabbits in the small museum. 10.00 Arrival at Verona and guided walking tour of the city centre and free time for lunch.